1.Preheat oven to 350 degrees F. Add cake mix and instant pudding to electric mixer bowl. In a measuring cup, add the lemon juice and cold water to make 2/3 cup. Add the eggs, lemon water and lemon extract to the dry ingredients and stir to blend. Pour in the oil and beat at medium speed for 6 minutes, or until very smooth. 2.Take 1/3 cup of the batter and set aside. 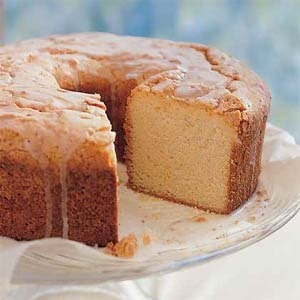 Pour remaining batter into a lightly oiled Bundt pan that has been sprinkled with sugar. Mix the reserved 1/3 cup of batter with the whole jar of lemon curd. Make a tunnel-like well through the batter in the Bundt pan and fill it with the batter-Lemon Curd mixture. Bake for about 50-60 minutes, until the top is golden and a toothpick inserted in cake comes out clean. 3.When the cake is done, let it cool on a rack, and then invert onto a plate. Sprinkle with confectioner's sugar and grated lemon peel and serve with a little Lemon Curd drizzled over if desired. Or glaze with the following: Combine 1/4 cup lemon juice, 1 teaspoon grated lemon zest, 1/2 teaspoon lemon extract, 1 cup confectioner's sugar. Pierce cake with a skewer all over the top and drizzle glaze over.